Why don't you play in SCCT book CS XXIII ? @Pika wrote: Why don't you play in SCCT book CS XXIII ? Because the book wasn't ready. I've sent Goi 5.1 CTG update 1 today. So, a noob question, how do I go by opening .bin? do you mean installing on engine or seeing its variants? @jorge, can I get your latest book please? @Retvon, the book is on sale. @jorge91 wrote: do you mean installing on engine or seeing its variants? yeah, how do I read it? 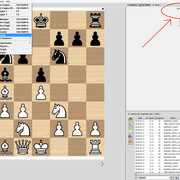 for the bin version you'll need Scid, for the ctg version you'll need Fritz or other Chessbase interfaces or Aquarium. @jorge91 wrote: for the bin version you'll need Scid, for the ctg version you'll need Fritz or other Chessbase interfaces or Aquarium. Ahh, I see, how do I go by opening it with SCID? I can't seem to find the options for it. What's going on with the book in SCCT ? Wrong settings ? @Pika wrote: What's going on with the book in SCCT ? Wrong settings ? I don't have a single clue... I don't know those books, except for Vitamin and Cerebellum... We'll wait for the games. No update of your book in SCCT ? Yes. Please everyone have a little patience. Massimiliano Goi wrote: Finally the update n.2 of the Goi 5.1 CTG opening book has been completed. The book is a database of 27.667.695 moves and it's sized 2 gigabytes... quite a huge book! This update has been made and conceived at first as an experiment because I wanted to try something new, but I didn't expect such a success in terms of score, the book performed great against the competitors, both free and private, as you can see in the Benchmaks subsection... most probably it's the adding of so much lines more. Results may vary, yes, so if you have a CPU system much faster than my i7-4771 (for example a Dual Xeon) you may want to shorten the variants length to something like 25 instead of 100. 25 is the averate move length with which I used the best computers on rent in the Cloud Room to create new variants and correct the wrong ones (providers: night hawk, ducu7, nitemoves and coffeeone). I apologize for the delay, but I have preferred to postpone of some day the publishing instead of giving you a product with some big flaw... I have limited at my best the "bad lines" (that aren't THAT bad, but bring to a losing position on competitions between computers, especially strong ones with alot of processors). Better to be meticulous so that you can trust my book at best; remaining evenctual errors in the book will be welcomed if reported, as usual, although I'm pretty sure to have built a solid opening database. I have to thank for the greatest part my opponent website MZChess for having provided hundreds thousands of raw games and Sedat Chess for other dozens thousands high quality games, that were then filtered, corrected, verified and if necessary even deleted. As I have already mentioned in past times, the 5.1 version will be my last release on competition books, at least for a while... After this update a minor one will follow next, then I will focus on other projects chess related and non-chess related and on my private life. - The settings for both Goi 5.1 CTG update 2 and Fauzi 1.6 were: Tournament book: ticked, Minimum games: 3, Up to move: 100, Variety of play: 50, Influence of learn value: 100, Learning strength: 500. Download here the games archives in Chessbase and PGN format. - The settings of Goi 5.1 CTG were: Tournament book: ticked, Minimum games: 0, Up to move: 100, Variety of play: 10, Influence of learn value: 100, Learning strength: 0. - The settings of Vitamin 14 were: Tournament book: ticked, Minimum games: 0, Up to move: 70, Variety of play: 141, Influence of learn value: 47, Learning strength: 0. - The settings of Medulla BIN October 2018 were: BestBookMove disabled, BookDepth: 100. Will you send this book to sedat ? Yes. I am working on it. For those who ordered today, I am thinking to make you wait for a more perfectionned version that will be the one who will get Sedat, but I can't guarantee anything, since the lines correction could be yet very long. If I won't succeed in a couple or hour or so I will send you the official update 2 ctg and when I will have finished to correct any person who has bought Goi 5.1 CTG will get this minor update for free. Goi 5.1 CTG update 3. So, the time of the final update has arrived. This is the last book/update I will make for a long while. I've thought this time it would have been easier ("a minor update" I said...) but since I've decided to participate to the SCCT tournament with this book I've made tons of tests and corrections in order to overcome any other main book. My previous update had gaps in the A28 opening and "weak" lines in the Semi-Slav... For the first issue I've selected some thousands A28 games from powerful Playchess computers, for the second one it was a work with tests and correction of lost games with deep analysis (aka Goi 5 technique) modifying the opening tree, often with my favourite cloud suppliers: ducu7 and night hawk. Both of them are great, ducu7 is the best match between power of processor (48 threads) and price. It wasn't easy to make best of all the books: sometimes I killed Vitamin but I lost with Power Of South Sumatera, other times I killed Caudine Forks, other times I got killed by Caudine Forks, others again my prototype lost in the Playchess room... it was a big work until I've corrected any error (I hope) and I was able to have a stable Elo score around 2500 on Playchess. What's more, IM Sergio Duràn Vega on the last minute suggested me a move for the White against the Sicilian Defense that left me impressed... I was mouth and eyes opened as CFish signed advantage for White... then I've decided to rent the night hawk computer and let it analyze that position for 5-10 minutes... Later I've discovered there were other 2 moves good for White, worthing to be marked as green. This International Master is not only a man with a solid theorical preparation, but he has also smart points of view and suggestions on the economical plan. I'm very satisfied with this book... Most probably it's the strongest one I've ever made since now. I'm also satisfied because I'm mastering the way to refine/tune/colour/mark the CTG books better and better. Now I will take a looong pause before to start to build other competitions books, I will focus on other projects, non-chess related and chess related such as The Oak. Settings for Goi 5.1 CTG update 3: Tournament book: ticked, Minimum games: 0, Up to move: 100, Variety of play: 10, Influence of learn value: 100, Learning strength: 0. - Settings for Hiarcs 14zcBook: Tournament book: ticked, Minimum games: 0, Up to move: 100, Variety of play: 50, Influence of learn value: 100, Learning strength: 500. - Settings for CaudineForks1977 10-01-19: Tournament book: ticked, Minimum games: 0, Up to move: 100, Variety of play: 151, Influence of learn value: 100, Learning strength: 77. - Settings for Vitamin14_n6s3m9_RC7_06dic2018: Tournament book: ticked, Minimum games: 0, Up to move: 70, Variety of play: 141, Influence of learn value: 45, Learning strength: 0. - The settings of Power Of South Sumatera 22-10-19: BestBookMove disabled, BookDepth: 100. Will we see your last update against Attacker Pro 3 in SCCT ? @jorge91 wrote: Goi 5.1 CTG update 3. I congratulate you for all your efforts Maximiliano, we hope to have you again soon by here with your books and all your other contributions very valuable and interesting.